What is the best coffee to use to make espresso? It depends entirely on what you like in coffee. We’ve tried to cover all the bases on this list so that everyone can find something that they’ll enjoy! No matter what type of roast you like or if you’re a fan of whole beans or pre-ground coffee, there’s going to be something for you on our list. Get your cups ready! Type: Coffee can either come as whole beans or grounds. Some people prefer whole beans because it makes fresher, richer coffee, but it’s a lot of extra work. Grounds are just the same most of the time, but it’s your choice. 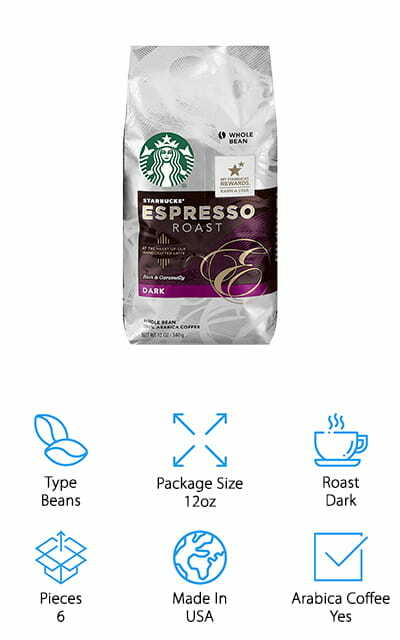 Package Size: How much coffee are you getting? Here, we’ll tell you how much you’re getting in each package. Beans tend to come in heavier batches because you have to grind them yourself, so keep the type of coffee in mind, too. Roast: There are a wide variety of different roast options, including dark, richer roasts, medium roasts that are a little lighter in taste. There are even some coffees on our list that are an Italian roast. Pieces: How many bags of coffee do you get? Some of these coffees come in multi-packs at a lower price, and so that you have a stockpile of espresso coffee ready for when you need it. Made in: Where is the coffee made? Of course, everyone has their preferences on what makes a great coffee, and this is one of those factors. Coffees on this list are made in the USA, Italy, and even Canada. Arabica Coffee: Arabica is the type of coffee plant that the beans are harvested from. It has a different taste than other types of coffee such as Robusta, and some people prefer it over other types of coffee. Everyone deserves to make the best espresso coffee, so we’ve given you some great options! Check out our top pick and budget pick for some variety, before skimming through the rest of the list. We’re sure that you’ll find at least one type of coffee here that you will love. With a ton of options for locations, roasts, and blends, you’re going to need to get your favorite mug ready! The best espresso coffee we could find is not going to be a surprise to anyone. Starbucks has steadily risen to be one of the best-loved coffee companies in the world, and their bagged coffee blends are perfect for making your own coffee drinks at home. These dark-roast whole beans have a full-bodied flavor, while still maintaining a sweetness that will match perfectly with steamed milk. You don’t have to leave the house to get your favorite coffee drinks anymore – now you can make it in your own coffee maker. If you grind the beans right before you brew them, you’ll brew coffee with a much better flavor. This purchase comes with 6 bags of coffee beans so that you won’t run out anytime soon. Plus, you’ll get them at a great price by buying in bulk! For the best espresso, Starbucks recommends that you use filtered water and clean your espresso machine often for a great taste! 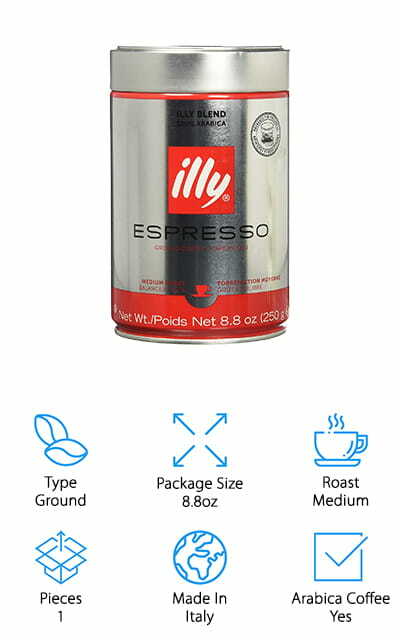 illy’s espresso ground coffee is made in Italy, and sourced from the very best Arabica beans in the world. These beans are complex, bold, and the blend makes them smooth and balanced. This coffee is a medium blend for a smooth taste that you’re going to love. The coffee is ground fine in order to get you the best flavor out of the beans, and packaged in such a way that it stays fresh for up to two years. It uses air-free pressurizing to keep the grounds fresh and ready to go. This blend is made exclusively of Arabica coffee, giving you a great taste that you’re going to keep coming back for, cup after cup. When you don’t want to go to a coffee shop to get your favorite drink, make it at home with this amazingly smooth, medium-roast blend that will hit the spot. You’ll get one 8.8-ounce bag with this order, enough to go around! 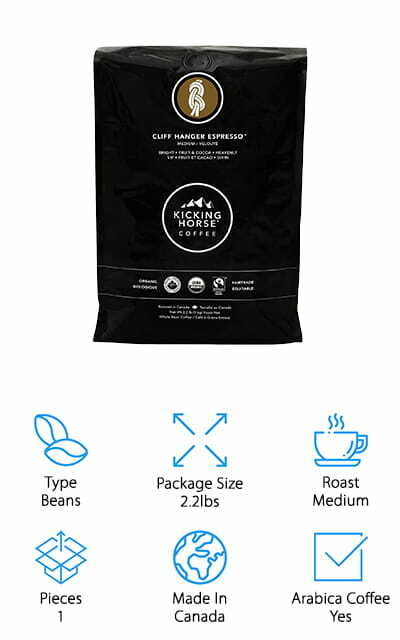 The creatively-named Kicking Horse Coffee company makes this medium-roast blend. It comes straight from Canada in packaging that will keep it fresh for a good long time. These whole beans will need to be ground before brewing, and in the process, you’ll make a bright, chocolaty blend with notes of delicious fruit. You can also use this espresso for cold brew, pour over machines, and French presses. Make it your preferred way to get the best taste! These Arabica beans originate in Africa, Central, and South America, and in Indonesia, and it’s fair for everyone that is involved in the process – even the planet. This espresso coffee is deep and robust, a smooth medium blend that will keep you coming back for more. Everything about this coffee is sustainable and delicious, so try it out today! You will definitely appreciate the deep notes in this espresso, and you even get plenty for the price as well. 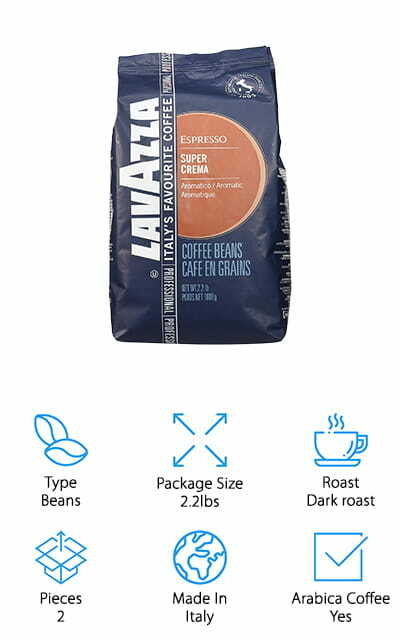 If you’re looking for a great, robust coffee for espresso machines, you should check out Lavazza Super Crema. This is a blend of 60% Arabica coffee and 40% Robusta coffee. Both lend their own special notes to give this coffee a delicious, full flavor. It’s a smooth dark roast, still mysterious enough to get your taste buds tingling. This coffee is made in Italy and comes packaged in airtight bags. These whole beans will need to be ground before you use them, or you can put them into an automatic grinder if you just can’t wait. These dark beans are oily and will give you the fullest, most delicious flavor that you can imagine from a blended coffee. It has a creamy taste, with notes of honey and almonds. You’ll craft the sweetest espresso with these beans, and you get over two pounds of them to continue to test different brew strengths. Find your perfect blend! This dark Italian roast from Coffee Bean direct comes in a five-pound bag, perfect for the long haul. This particular blend is a rich, artisan coffee that has notes of molasses and cocoa in it. There is no additional flavoring added, just a blend of Arabica and Robusta coffees from Africa, India, and South and Central America. Nothing beats professional coffee in your coffee maker at home. These are the best coffee beans for superautomatic espresso machines because of how much you get in a single order. With a superautomatic espresso machine, the machine will go through the entire coffee-making process from grinding to brewing, and you can fine-tune every aspect of the finished product. Try different settings to find your favorite version of this robust coffee. It’s made right here in the USA, and it’s dark and delightful. Get your cups ready, because there is going to be plenty of this Italian Roast Espresso to go around. 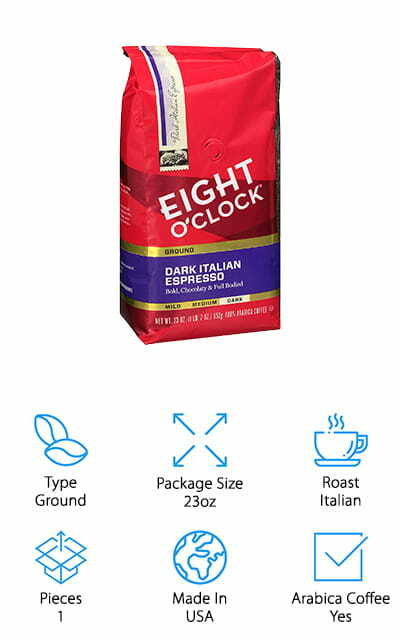 Eight O’Clock makes another Italian roast coffee, but this time the beans are ground for convenience. You can also get this and many of their other blends in whole beans – in fact, that’s what they’re known for! 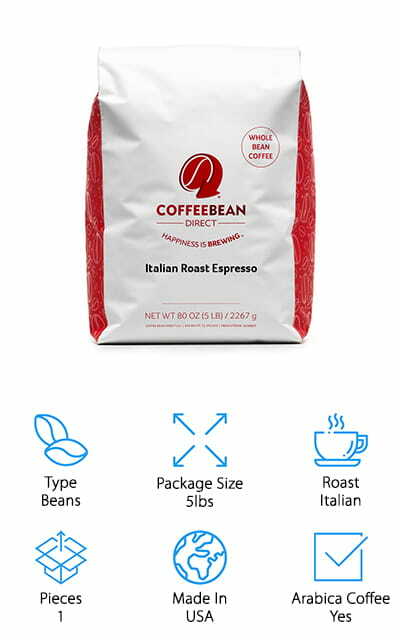 This particular Italian roast is great for people who already know and love espresso and cappuccino, especially if they are willing to try something new. It doesn’t get much better than this dark, chocolaty blend. It’s bold and full, and you’re going to love drinking it. It’s made with 100% bold Arabica coffee, and as an added benefit it’s also Kosher certified. The packaging allows for the coffee to remain fresh for you, so you can enjoy it now or later. This is a great coffee blend because it manages to have a great coffee taste without any of the bitterness that is usually associated with dark roast coffees. That’s why it’s so popular among espresso aficionados and coffee experts. 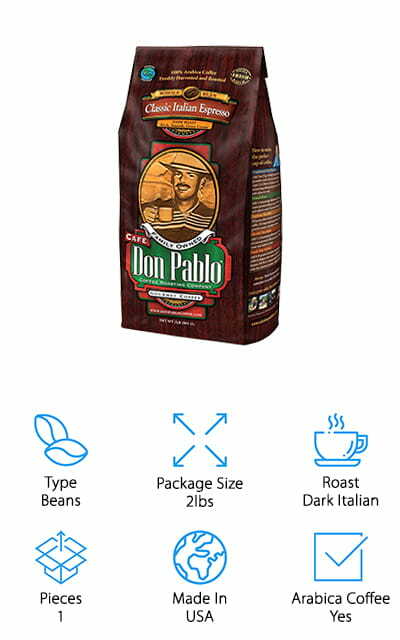 Café Don Pablo makes these gourmet whole coffee beans. They come in two pounds and are dark Italian roast, great for that dark, rich flavor that you’re craving. It’s a smooth blend that uses a blend of Colombian and Sumatra strains of coffee to make a deeper flavor that is complex and delicious. They harvest only the largest high-quality beans to be roasted and packaged. To make your espresso, you will need to grind the beans or allow a grind and brew coffee maker to do the work for you. This helps to extract the flavor and steep the coffee longer, much in the same way traditional grounds do. This just allows you to have a fresher cup of coffee. This espresso doesn’t just take good, it is good! It’s got a complexity that brings together several different traditions with a flair that you won’t soon forget. How long do you think you’ll last before purchasing another bag? 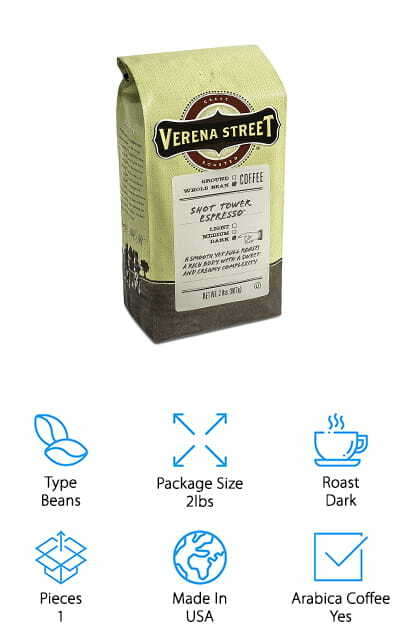 These espresso beans from Verena Street are probably the best coffee beans for espresso machines that we’ve found, so of course, they had to have a place on our list! This is two pounds of whole, dark roast espresso beans that you can grind yourself for a rich-bodied, sweet brew. It’s a complex taste that doesn’t quite match up to anything else on our list so far. It’s roasted and packaged right here in the United States with sustainably-sourced Arabica beans. These are some of the best coffee beans for espresso machines, but you can also use them in the grind and drip coffee makers for some great espresso when you’re not with your machine. These versatile beans are also kosher, so they’re great for your kosher-observing friends who love coffee. There are enough beans here to make espresso for a long time, especially if you don’t drink it often. It’s a great value, all things considered! 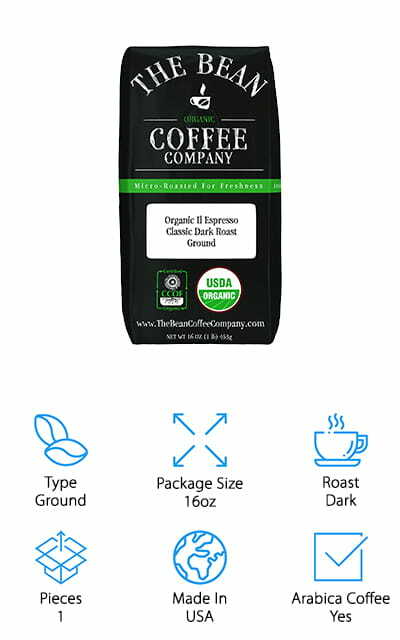 The Bean Coffee Company makes this Organic Espresso in a dark classic roast with a full-bodied taste. 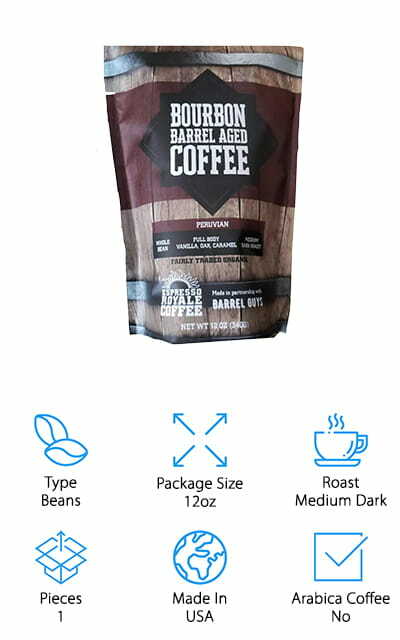 This 16-ounce bag of ground espresso coffee is made from 100% Arabica coffee that’s been roasted in the USA. The company is known for roasting their organic beans in smaller batches and grinds them the at the peak of the cycle. This means that the natural flavors, antioxidants, and freshness are at their peak, too. When you put it into your espresso machine, it’s going to be the best that it can be. The Bean Coffee Company recommends storing your coffee in an airtight container where no light, heat, or moisture can get to it. This allows you to keep your coffee fresh and ready for making espresso whenever you need it. Did we mention that it’s completely organic? All of the Arabica coffee used here is organic, so if that’s important to you, you need to check this coffee out! Bourbon Barrel Coffee from Espresso Royale is a unique coffee, and not just on our list. That’s because the beans have been aged in barrels where bourbon has been previously made. This gives the beans a unique, bold flavor with an aroma to match. They are delicious, a medium-dark roast from Peru with vanilla, oak, and caramel notes, all packaged neatly into an organic whole coffee bean. If you’re truly looking for the best artisan experience, you very likely haven’t had anything like this before. Who knew that combining Kentucky bourbon with coffee would turn out so well? When you grind the beans, they release a truly unique, delicious aroma that you’re going to love smelling when you make this coffee. It comes in a single package that is only 12 ounces, but you’re going to want to savor every drop anyway. So why not try it out? If you enjoy bourbon and coffee, try Espresso Royale!